Released in its native French in four volume installments over the course of 2009 to 2014, Laura Zuccheri and Sylviane Corgiat’s The Swords Of Glass (Humanoids) has the hallmarks of a contemporary classic. Too often, European fantasy set in “times long ago” relies on lazy clichés and stereotypes as crutches which prop up a familiar plot, making the work feel staid and repetitive. Not so here; Zuccheri and Corgiat instead focus on the conjuring of the newly imagined: a gorgeously rich world filled with strange and wondrous creatures, anchored with layered and interesting characterization. Yama, the daughter of the village chief, sees her father murdered in front of her on the very day a mysterious sword falls from the sky, embedding itself into a rock. All who touch it turn to glass—except for Yama, who vows to use it gain revenge on the man who destroyed her family. That’s really just the tipping point of this story, though, as the swords are tied into a larger, world-spanning destiny detailed in an old prophecy. What’s impressive about The Swords Of Glass is the manner in which its narrative runs and evolves: unafraid to wrap up integral arcs (for example, Yama bringing down her father’s killer) and move forward. It’s a refreshing approach to not see plotlines dragged out, but confidently addressed, and one that allows people to be the integral pivot on which the story hinges. However, it also leaves the book with some very obvious crease lines, and the feeling of distinct acts, almost to the degree that they read as separate stories with the same characters: “The continuing adventures of…” That may, in part, be due to the French model of serialization; releasing an installment every year or so with an aim to provide readers with a substantial experience. What stops these turns from being too jarring are the bedrock of consistently well-realized characters and longer, continuously interwoven arcs that lend a sense of cohesiveness to proceedings. Humanoids understand the importance of its European properties retaining the larger volume size they’re originally published in, and The Swords Of Glass is an irrefutable argument as to why. Laura Zuccheri’s art is utterly breathtaking and fundamental in completely immersing and investing the reader into this world. Lingering over the realism and detail of her paintings of this fascinating, fantastical place is a singular pleasure. Lush and rich, yet crisp and fresh, she renders light magnificently, moving from beautiful landscapes to the intricate architectures of cities and beyond. The sureness and beauty of her portrayals, costumes, and creature design are what makes this world such an intriguing one to visit. It can be difficult to convey the scale of something that is intended to be epic in nature, yet still retain a sense of closeness and connection, but Zuccheri is more than up to the task. Some days it seems like everything is ruining somebody’s childhood. Nostalgia is still one hell of a drug, but now and then something comes along that flies in the face of expectations and manages to capture that comfortable familiarity while doing something completely new. Given that the reactions to the Jem movie’s first trailer have ranged from an underwhelming “meh” to outright derision, the astonishing success of the new Jem comic is all the more welcome a distraction. 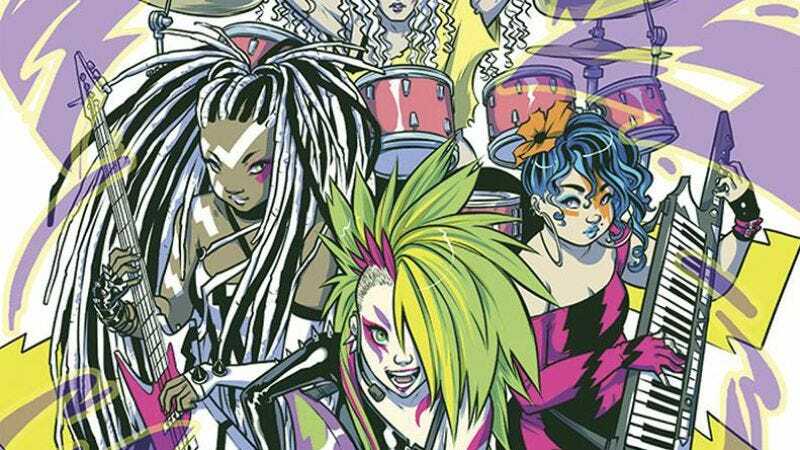 The team behind Jem And The Holograms #2 (IDW) is an interesting one in that not only are they all relatively new to the industry, they’re all three women. Writer Kelly Thompson may be best known for her comics commentary, providing analysis and reviews for several sites as well as the excellent 3 Chicks podcast. Her years of insightful and pointed criticisms have served her well, because once put in the position to practice what she preaches, she’s pulling no punches. Many people, particularly underrepresented minorities, are often told that if they don’t like what the comics industry has to offer, they should make their own content; Thompson and artist Sophie Campbell are doing just that, and they’ve knocked it out of the park. This is one of the most diverse casts in a mainstream comic, without feeling heavy-handed or forced. Jem And The Holograms #2 is strong enough to stand alone without the first issue, though it is definitely worth picking up the story from the beginning if possible. The recap at the beginning of #2 is more than enough to catch you up; this isn’t an intensely complicated or heavy story, but it is eminently fun and readable. Now that the main characters have been introduced, Thompson is taking the time to flesh them out and differentiate their voices. It feels a little like Thompson and Campbell are showing off, with panels full to the brim with body language and facial expressions that say just as much as the dialog itself. Pizzazz and Kimber in particular are riotous collections of movement and stink eye, but Shana and Jerrica’s more subtle mannerisms are an exercise in how much complex characterization can be packed into a relatively limited medium. There are panels that could do with a little more detail in the backgrounds, but the double-page spreads at the beginning of the book are rich and interestingly layered. What makes everything pop right off the page are M. Victoria Robado’s candy-coated colors. Everything looks like Jolly Ranchers and Pixy Stixs, and the arrival of the Misfits’ sharper color scheme as a band is a welcome addition to the sometimes overwhelming avalanche of pink. We Can Never Go Home (Black Mask) features a superpowered young woman with incredible strength and unbreakable skin, but it isn’t a superhero comic. A coming-of-age thriller starring two suburban teenagers, this ongoing series uses the superhuman element primarily to push the characters into increasingly dangerous situations as they run away from home and quickly discover they are ill prepared for the obstacles in their way. Superpowers are a way to accelerate the story’s momentum by injecting some fantasy into the adolescent domestic drama, but writers Matthew Rosenberg and Patrick Kindlon sacrifice character development in an effort to keep the stakes consistently high. Rosenberg and Kindlon have a solid central concept with this title, but not enough time is spent establishing the foundations of Duncan’s and Maddie’s characters and how they relate to the world around them. The script barrels through exposition to get to the action, but if this is going to be a character-driven narrative, it can’t rush through the basics of who these people are. Maddie’s backstory is detailed on a page that condenses loads of information into 25 small panels, and the busy layout is a visual indicator that the script is trying to cover too much in the limited space. The page does show off artist Josh Hood’s talent for expressive talking heads, but cramming all those panels prevents the individual beats of the conversation from fully landing. The story needs more specificity because the cast fills very generic roles at this point: Duncan is the brooding social outcast; Maddie is the mysterious beauty; Ben is the boorish football player bully. The big cliffhanger of the first issue—the moment that forces Dustin and Maddie to go on the run—only works if the reader sympathizes with Dustin and despises the father who abuses him. But their relationship barely gets any attention in the script, so it’s hard to make any strong emotional connection. The second issue greatly benefits by delving deeper into Maddie’s home life and her bond with her adopted parents (who have their own shady secrets), and the writers need to find the right balance of intimate, personal storytelling and more fantastic, action-packed elements going forward. History is written by the victors; this is true in superhero comics as well as in life. Readers know Superman, Batman, and Spider-Man because these characters have proven consistently popular through multiple decades of existence. You don’t usually hear much about the other guys, though—those hordes of slightly less successful super-folk who may have once been contenders but were ultimately just pretenders. And this isn’t even the B- or C-list we’re talking about: The likes of Matter-Eater Lad and Darkhawk are household names compared to some of the Z-list characters who populate Jon Morris’ The League Of Regrettable Superheroes (Quirk Books). Making fun of lame superheroes is nothing new, as any Aquaman fan will attest. But Morris’ compendium is less focused on pure snark and more attuned to historical context and even, occasionally, genuine affection for these star-crossed paladins. Morris is proprietor of the long-running blog Gone & Forgotten, one of the oldest comics websites and certainly one of the funniest. Longtime readers of Gone & Forgotten might be disappointed to find that Regrettable Superheroes is not as funny as the site, but Morris’ book downplays his website’s occasionally brutal mockery in favor of a more nuanced attempt to understand the motivations behind the genesis of these largely unloved creations. This makes sense, given that characters like Kangaroo Man, B’Wana Beast (as offensive as it sounds), and Adam-X The Extreme do a fairly good job of ridiculing themselves. Still, one of the book’s recurring themes is the degree to which even the most seemingly unpromising superhero premises still reflect a powerful commitment to ingenuity and invention. If comics history tells us anything, it’s that one era’s laughingstock can become another era’s touchstone with just a little effort and imagination. There’s no better example of this principle in action than Marvel’s Squirrel Girl—once the living embodiment of a punchline character, later rehabilitated as a light-hearted adventurer who embraces her own absurdity. As Morris describes, her “bubbly, optimistic, and arguably frivolous presence” just needed the right context in which to shine. It would be difficult to argue that all these guys are potential diamonds in the rough—it’s a steep hill to climb imagining any universe in which the likes of the Clown and Sonik became mainstays. But there are flashes of brilliance in more than one might suspect. Be it in the form of a striking visual or memorable high concept, many of these guys could already have the necessary goods to graduate from zero to hero, with a little prompting.